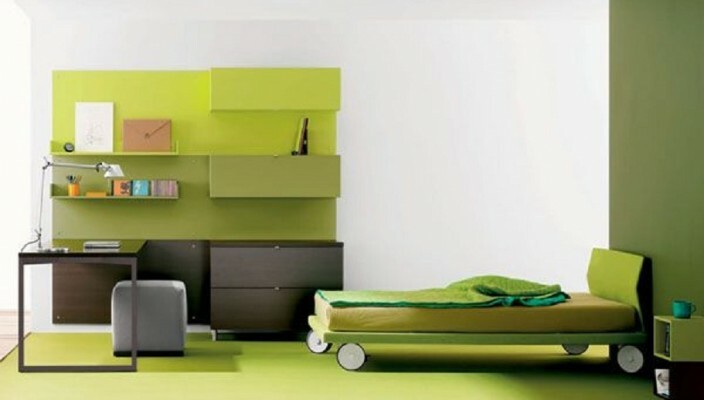 A unique design theme that uses green for creating a smart ambience for a teenager’s room with a special bed and green flooring. This simple and realistic bedroom idea is all about style and essence blended well in a green theme. The main attraction of the room is the bed that looks more like a cart on roll in complete green. The walls and the storage units are in green, as well, with computer and study table in a wooden finish in a dark tone. The floor is also in the same green shade with one of the walls in white for some amount of contrast.